I’ve become a bit discouraged with watercolor skies, so I decided to revisit portraits for a bit. (See my other Famous Faces at this link.) It’s probably been over two months since I’ve done one, but I do enjoy them. It was a pleasure staring into this man’s eyes, I’ll tell you that. Please feel free to guess, as I’m holding all comments in moderation. If you guess and do not see your comment appear in a few hours or so, then you’ve guessed correctly! 😀 I’ll reveal everyone’s comments/guesses later on this afternoon. I don’t want to say too much about this person, and spoil the guessing game. Suffice it to say that he is a person whom I admire deeply, but not (only) for the obvious reasons. I simply admire him as a human being. I’m looking forward to reading a biography about him. If anyone can recommend one, I’d love to hear about it. I got a big hand up from the raw umber Polychromos colored pencil. I really cannot recommend these pencils highly enough. This was done in a Strathmore spiral-bound drawing sketchbook. The paper is nice, but only nice. The plan was to sketch him there and then do the final in a Stonehenge sketchbook (perfect marriage of paper and medium). However, I liked the sketch so much that I decided to go with it, instead. I may revisit him in a different pose; he was (and is) a joy to stare at, in my opinion. It is a very good likeness! so that was easy. I envy you, I am hopeless – cannot even capture a likeness for my husband and I see him every day!! lol! I think people we know are more difficult though! If you’re really interested in portraiture, I’d say try someone like Clint Eastwood, who’s fairly easy to recognize. I’ve tried drawing my husband too and it never works out either. …..it was immediate recognition once I looked into The Holy Father’s beautifully-rendered eyes. Thank you, Lance. You guessed correctly. I’m so glad you enjoyed this. I don’t know who he is but it’s a very good portrait – subtle and delicate. Thanks, Nicola! I appreciate it. I enjoyed doing it. I’ve been missing portraits (without realizing it). Wonderful portrait, beautiful warm expression. And you’re right, great eyes. Brown pencil just seems to work well with people. Thank you! Yes, all of the lighter browns seem to work well. This one is erasable, and I did need that in this case, as I freehanded it. Had to extend the nose quite a bit in the final analysis, so I’m glad I didn’t choose a darker brown. I love his eyes. I’m glad you like this one. LOL, Thank you, CAS! You guessed correctly! He was so much fun to draw, I think because of that sparkle. He has such a good aura around him, I don’t know how else to describe it. I’m glad you liked it! Likewise, I don’t recognise the face, but you’ve captured his character very well indeed. Well done! Thank you, Margaret! He was a pleasure to draw. I’m looking forward to revisiting him. Just back from a rainy graduation party. WIne time and chillin’ More graduation parties tomorrow…. Thank you, Teresa! As always, you make me feel like a million bucks! You guessed right! I think I’m better at stormy skies, but fair-weather, puffy-cloud skies are a whole other matter. I’ll keep trying though. I don’t give up quick! You got it! 😀 He was wonderful to draw. Nice rendering, especially of his radiant smile and eyes. Is it Pope Francis? It is! Thank you! I’m looking forward to drawing him again. So much glee behind his eyes; it was a real pleasure. Thanks, Jennifer! It was fun. I need to do more. Yes good to move on to something new when bored glad to see some of your portraits! Great likeness, and I agree, admirable not for the obvious reasons. How much time do you spend on a portrait sketch, approximately? Seems like you whip them out. Thank you, Jo. Usually, about an hour. I think this one took closer to two, because I’ve not done one in awhile and also because I kept seeing things I wanted to fix. Other than MLK, I’ve never cared so much about getting a portrait right. There are still things I could fix about this, but I would’ve been fussing all night and finally decided to stop fussing. I’d like to revisit him instead. I do plan to revisit MLK as well. I’ve found the key to a good portrait is to choose someone I really admire. And it helps if staring into their eyes…..you see something inspirational there. If that makes any sense. I’m glad you enjoyed this. Lovely portrait of the Pope – do like the expression and likeness. Thanks, Mary! I’m happy you like it. 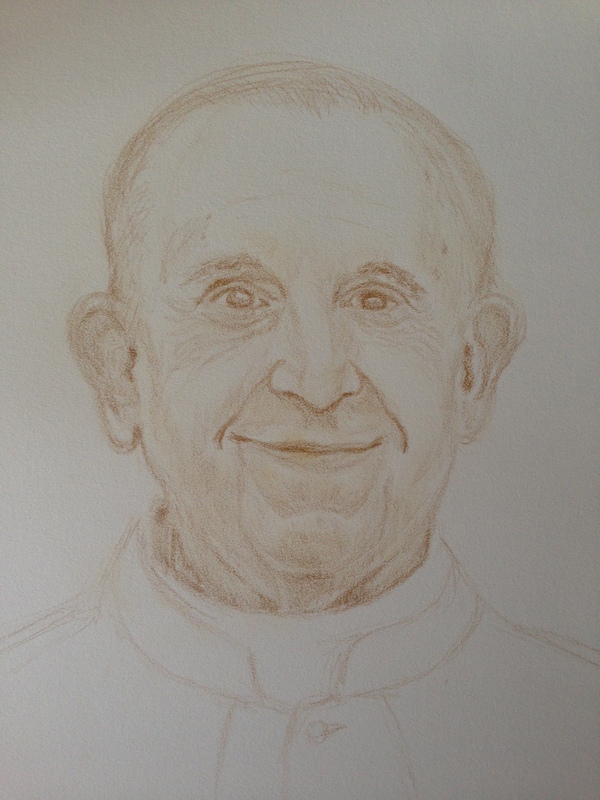 Nice portrait of Pope Francis, Laura. Your soft marks convey your sense of his serene nature. Good portraits focus on the triangle of the eyes and mouth, and you captured it nicely. They also say the most identifiable feature of a person is the shape of the head – that if you don’t get that right none of the details matter. Looks to me like you nailed it. I saw the Pope immediately. Compelling portrait! Thank you so much, Tom! You are correct, and I learned a few things from your very kind & informative comment! I didn’t realize the shape of the head was so important. I’m really glad you mentioned that. I’ll try and keep that in mind for future portraits. I do enjoy them. Thanks again! You got it, Rebecca! Thank you! Great drawing of the Pope. Thank you, Jean. I was hoping you would like this one. I never know if a portrait will turn out when I sit down to do one, but I’m really glad this one did. Glad you enjoyed it. Gollum liked it, too! Lol! Stupid me. I thought it was the drummer for the Stones. Francis! I like him! He’s just what the world needs right now! Thank you so much, Fabio! You’re very kind! He is a wonderful subject.